As June winds down, the Virginia football team is closing in on two months from kickoff. Sunday marks that point on the calendar as the Hoos open the season on Sept. 1 against Richmond at Scott Stadium. That game is scheduled for 6 p.m.
During the “99 Virginia Football Thoughts Before Kickoff” series, I’ve piggy-backed on a couple of other ideas from Athlon Sports so give the site a click here. The publication’s preseason rankings helped provide context for one article and the ACC coaches’ rankings sparked another. Athlon released another ACC-focused article Tuesday and that leads this series into the next entry. For Virginia, the two picks were quarterback Bryce Perkins and cornerback Tim Harris. Both are certainly reasonable picks. Perkins steps in to help facilitate an offensive overhaul in Bronco Mendenhall’s third season as the Hoos shift to a more option-based attack. Harris returns for a sixth year at UVA that makes him a player fans can get behind with rooting interest this season. I thought it might be interesting to throw out some alternative options as wildcards for the Wahoos. R.J. Proctor. Earlier in this series, an entry focused on the center position and how Tyler Fannin could lead to other shifts around the offensive line. A junior entering his fourth year in the program, Proctor also could cause a ripple effect up front. One of the options at guard, he has started six games over the past two seasons, which included five times last year. UVA credited him with 22 knockdown blocks in 2017. If Proctor emerges as the starter at right guard, that should buy time (or at least provide versatility) for one of the younger linemen among Chris Glaser, Ryan Nelson, and Ben Knutson to continue to develop without starter’s pressure. Why? If Proctor provides starter snaps at guard, that allows grad transfer Marcus Applefield to start at tackle. Keep in mind, the coaches will be looking for the best combo of five and then some playable depth so Proctor figures to be in the mix somewhere. Joe Reed. Everyone knows that Reed can be a factor on special teams where he returned two kickoffs for touchdowns last season. But teams might not even kick to him this year with the new kickoff fair catch rules in play. Where Reed can be a wildcard is on offense, though. Last season, he caught 23 passes for 244 yards and two touchdowns to go with 21 carries for 112 yards and one touchdown. Those are decent sophomore numbers. The coaches, however, have openly stated since the middle of last season that they want to get Reed more involved. The truth is, the offense is going to need some more punch this season with Doni Dowling and Andre Levrone both gone. Is Reed ready to produce consistently? Last year’s numbers represent fewer than two catches per game. How he handles an increased role could be a big wildcard for the offense. PK Kier. Virginia wants to improve the running game this season and some of that is expected to come from Athlon’s wildcard choice in Perkins. Still, UVA relied heavily on Jordan Ellis last season as he was the only player with more than 30 carries on the roster and he’s the only returning running back with more than 11. Kier tallied just six carries last season as a true freshman, but emerged as a possible candidate for more during spring practice. If Kier or fellow sophomores Lamont Aktins and Jamari Peacock can provide some depth, that would help the running game. Malcolm Cook. Following a season-ending injury in 2015 and sitting out all of 2016 with a heart condition, Cook returned to action last fall. He logged six starts in nine appearances and missed four games with an injury. He ended up with 46 tackles. 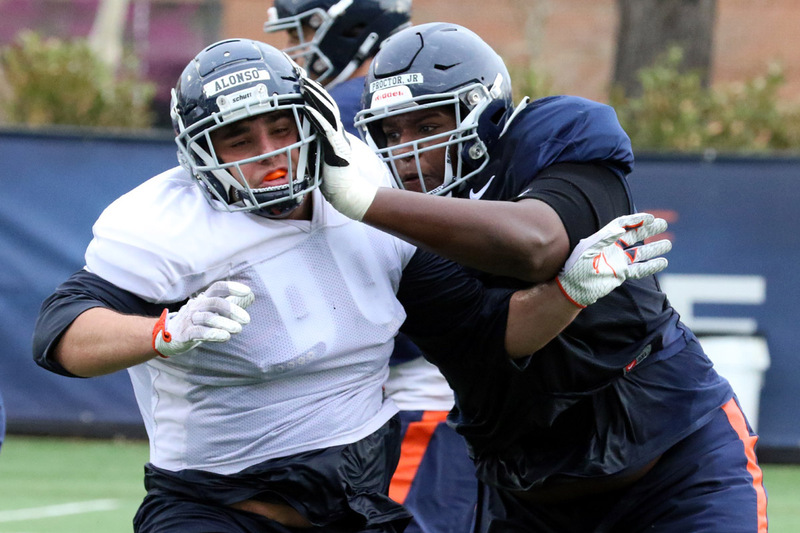 During spring practice, the Hoos experimented with Cook at inside linebacker after he played on the outside in 2017. That’s the same move Jordan Mack made a year ago. If Cook sticks at inside linebacker and then steps up to handle starter duties, it could help the defense put more speed on the field and provide versatility to the LBs too. Dylan Thompson. The Cavaliers needed depth on the defensive line to get out of code red territory with numbers and they found an option in the grad transfer from Ohio State. He played just two career games at OSU due to knee injuries and a missed season due to academics. Still, at approximately 6’5” and 280 pounds, he’s a potential monster on the D-Line. He tied a school record at Montini Catholic (Chicago area) in high school with 17 sacks. Even if Thompson just provides Jack Powers type of presence and not big sack numbers, that would be a big boost for the line, though. Powers transferred in ahead of the 2016 season, played in all 12 games, and made 13 tackles while providing a lot of snaps up front. Joey Blount. Prior to a collarbone injury that took him out of spring practices, Blount had been making a lot of noise for the Hoos. The defense needs to replace Quin Blanding, who departed as the program’s all-time leading tackler. Plus, ACC Defensive Rookie of the Year Brenton Nelson missed the spring with an injury, so early on Blount played alongside Juan Thornhill and was getting praise from Mendenhall in media interviews. If Blount can bounce back from the injury, it gives the Hoos a lot of options for sub defensive packages that could put Thornhill, Blount, Nelson, and someone like linebacker/safety hybrid Chris Moore at varying spots in the scheme. That makes it hard for offenses to dissect and could lead to some disruption for the Cavaliers. Another amazing article and I acknowledge that it would be incredibly difficult for anyone outside of the coaching staff to come up with creative articles like you have been publishing.